step in her career, running with the Southeast Super Truck Series in 2018. Taylor Hosford has had racing in her blood from an early age. Her father, Tracy, was a pit crew member and tire changer on the NASCAR circuit from 1997 to 2000 working with Rick Hendricks Cup team with drivers Ricky Craven and Terry Labonte then with the NASCAR Truck teams headed by Jack Roush. Again he worked with Craven as well as young up-and-coming driver Carl Edwards. Born in Deland, FL on May 19, 1995, Taylor was ready to go racing by the time she turned seven racing and winning in the Quarter Midgets at Little New Smyrna Speedway. She considers one of her biggest accomplishments winning against some of the best racers in the country at a track inside the Indianapolis, IN Motor Speedway. When she was 13, Hosford’s family moved to the North Florida town of Madison, where she resides today. With no Quarter Midget racing in the area, her attention turned to karts running with the adults in the bigger classes. Hosford eventually took three track championships on asphalt and two runner-up titles on dirt racing at the popular Cross Roads Motorplex located in Jasper, FL. At the time, Cross Roads Motorplex was also running Mini Cup cars on their asphalt track and Hosford decided to give them a try…it was a very good move. She won her first Mini Cup race right after climbing behind the wheel. In fact, Hosford went on to win 18 races in a row and the season championship in her first try. Then it was time for bigger things as she got her first taste of actual stock car racing entering around ten events on dirt at North Florida Speedway in Lake City. But Hosford wanted to try something really different and Pro Trucks looked to be the answer. It gave her and her family a chance to travel to different tracks around the State of Florida. Running mostly with the Southern Pro-Am Truck Series, Hosford took second in points for the 2016 season and gained tons of experience at a variety of different racing facilities. Another challenge came about in mid-2017 as Hosford began racing a Legend Car with help from Little Gator Legend Cars. In her first race at Auburndale Speedway she won her heat race and had a great run in the feature against drivers with much more experience in the Legends than she had. 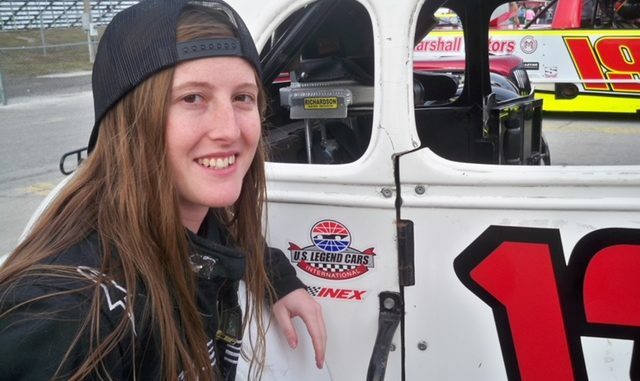 For 2018, Hosford is going all-out with her racing endeavors as she plans to run as many Legend Car races as possible. But her biggest move has been securing a ride with Mike Green Motorsports to run the Southeast Super Truck Series that competes primarily in the Carolinas. The Series has a total of twelve races scheduled and Hosford hopes to run in ten of those. She also plans to run a Super Late Model also owned by Green and a Sportsman car for Scott Cornman in around three to four races in Florida. Hosford will turn 23 in May and has much more on her plate than just racing. This year she is attending real estate school and working hard on getting her real-estate license. Keep your eye on Taylor Hosford in 2018. 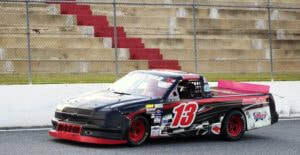 She hopes her continued success will lead to a possible ride on the NASCAR K&N Series and even more in the future. Just keep looking for that lucky 13.